On October 18, Governor Andrew Cuomo welcomed Troy High School teacher Justin Haviland to the Master Teacher Program. Haviland and 213 other outstanding teachers were recognized for their dedication to providing the most innovative Science, Technology, Engineering, and Math (STEM) education to their students, their commitment to professional growth and their enthusiasm for sharing their successful practices with colleagues in their schools and districts. Haviland, a Living Environment and Biology teacher and girls’ soccer coach, has been at Troy High School his entire 13-year career. 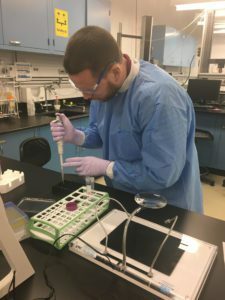 During that time he has participated in various summer research programs such as the Questar III BOCES Science Research Program at Wadsworth Labs. Here he worked side-by-side with professional researchers conducting authentic scientific research in the area of genetic mutation. 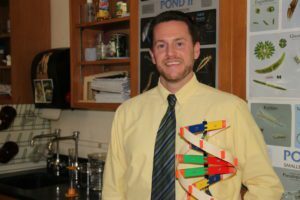 He also participated in a New York State Stem Cell Science (NYSTEM) funded program for high school teachers at Rensselaer Polytechnic Institute where he conducted research on stem cells and fruit fly genetics. The program is intended to ultimately introduce stem cell research fundamentals to high school students, generating a pipeline of future researchers in the field. The Master Teacher program is a way for experienced STEM teachers to share their knowledge with new teachers. They also go through an extensive application and interview process. The process includes a content area test, written essays and a presentation. Master Teachers attend regular cohort meetings and participate in and lead professional development activities throughout the year. Teachers who make a commitment to mentor other teachers will receive $15,000 annually over four years. Haviland is the second teacher from Troy CSD to be named a Master Teacher. Earth Science Teacher Kim Bruton was named a Master Teacher in April 2014. To learn more about the Master Teacher program, please visit http://www.suny.edu/masterteacher/.